The star register consists of a special register page containing all of the essential information about your star. Do you absolutely love space? Are you looking for cool ways to eternally admire your star? Then name a star in the Online Star Register! When naming a star you are able to choose a star name, a star date and a constellation. After having registered your star, you’ll receive a unique OSR registration code that you can use to find the star in the night sky. Would you like to know more about finding your star in our star register? Read all about it! The star register is a public register that includes all stars that have been named in the Online Star Register. When you name a star, it is registered forever and will shine in the sky for millions of years to come. Your star is visualized directly on the page with special software, where you are able to see the universe surrounding your star. Enter your unique OSR registration code and instantly find the following essential information about your star. You will receive a unique OSR Code when naming a star, so each named star has a special registration code. Our registration code consists of letters and numbers, for example LPR805246. Different star registrations with the same star name may occur, for example Starry. Nevertheless, the star coordinate and registration code are always unique and can only be included in the star register once. Now you will be able to name a star for that special someone! Or you can name it after yourself and your partner. The register also indicates your stars coordinates. Your star coordinates contain numbers and letters. RA indicates Right Ascension and dec indicates declination. They are similar to latitude and longitude, but they relate to coordinates in the sky. Mag stands for magnitude, which indicates the brightness of the star. Use these coordinates to determine where your star is located on the OSR Star Map found in the OSR Gift Pack. The star register also shows your chosen constellation. Your star coordinates are based on the constellation you chose in the order form. In astronomy a constellation is a collection of stars that form a pattern in a variety of figures. Some constellations are part of the zodiac, such as the Aries and the Leo. These are part of astrology, which is used to calculate your horoscope. When naming a star you can choose from 88 constellations, including the zodiac signs. Just keep in mind you cannot see all constellations from where you are, as some constellations are visible from the northern hemisphere and others are visible from the southern hemisphere. The occasion for which you have named the star is also displayed in the register. You can choose from 16 different occasions, each with a special theme. Celebrate love or the birth of a new baby by giving a star. Don’t have a special occasion to name a star for, but still want to give a star to someone special? We offer a general Gift Pack suited for all gift occasions. Our 16 occasions come with beautifully designed theme papers, both in the digital package and in the package sent by post. The Gift Packs are also available in 20 different languages. You can find the occasion displayed in the register in the language you selected for your Gift Pack. The star register will be updated within a few seconds, so your star can be found in the register and via the various apps immediately. Visualize your star at any time using our special stargazing apps. Stars named in the Online Star Register can be viewed in 3D using our One Million Stars browser app. The app contains even more information about your star and the environment in which it is located. Discover stars near yours or navigate to your personal star page. Use the app to take a tour through the universe, or to search for your star directly. Use your unique OSR registration code to find your star. View the star up close and discover the brightness and color of the star in spectacular motion. The app mimics the actual star in high definition, which allows you to view the star in close detail. To observe this level of detail with a telescope is not always possible, for example during bad weather. With the app you can also view famous stars, such as Polaris, Bellatrix or 82 G. Eridani. Insert a star name and the app will take you to this star. In addition to the brightness and color of the star, fascinating facts are mentioned, such as the distance from the earth in lightyears. Use the free One Million Stars browser app to discover everything there is to know about the stars. There are more ways to find your star. Your star has unique coordinates that direct you to the exact part of the universe in which your star is located. With the OSR Star Finder app you can navigate to your star using your mobile phone. Here you can use the OSR registration code to search for your star. Not only will you find information about your star, you’ll find more information about the specific constellation in which your star is located. 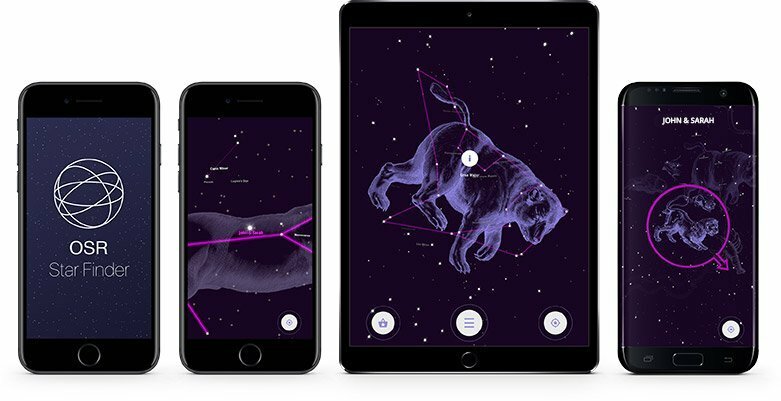 The app gives you the opportunity to view constellations you can see from your location, which enables you to make the best choice for naming a star. The Star Finder app is free to download for iPhone or Android. Anyone who wants to know more about known stars and constellations are able to use this app. Be inspired and impress others with your knowledge about stars and the universe. Naming a star in the Online Star Register comes with a eternal registration in the star register and a number of free apps to visualize your star. Take a journey through the universe, see the stars up close and experience a unique view of the universe. Our apps are free to use for anyone who loves stargazing. Discover useful information about constellations and famous stars in beautiful designs. Name a star star and shine forever bright in the sky. Use your OSR Code to search for your star in the Online Star Register. View the coordinates of your star, the star name and star date, including the name of the constellation and your chosen occasion. Use the One Million stars app to admire your star up close. Find your star at any time, day or night, in clear or cloudy weather. Naming a star becomes a special event by placing a registration in the number one Star Register. Name a star and surprise friends and family with an original gift which can always be viewed. Make your gift last forever and enter your star in the Online Star Register! Find your star in the star register!